PRMC’s annual HealthFest is back with free health screenings, exhibits, and more! SALISBURY, Md.– Get ready for activities, exhibits, screenings and more. 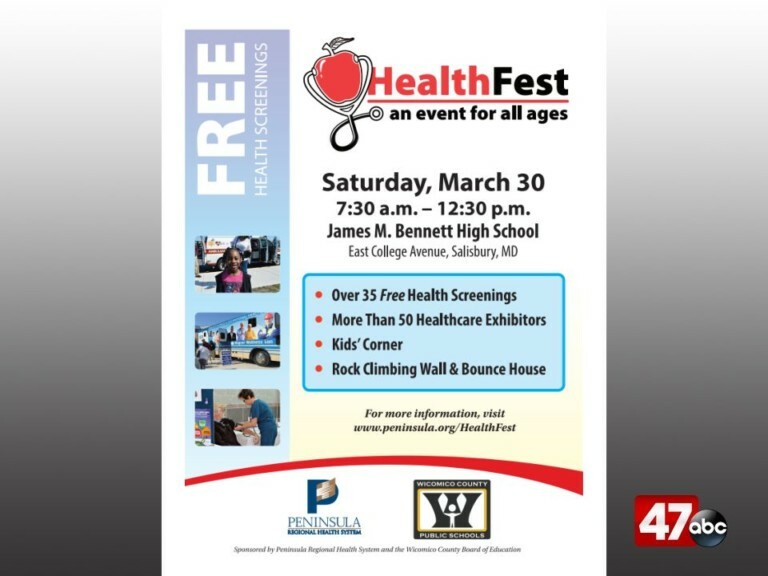 The 2019 HealthFest will soon be making it’s way to James M. Bennett High School. 47 ABC’s Erica Murphy was joined by Roger Follebout from PRMC to learn more about the event on Saturday March 30th. There will be over 35 free screenings offered which include Skin, Bone Density, Blood Pressure, Vision, Hearing, Stroke and Spine exams. There will also be screenings that can detect diseases such as cancer and diabetes. The United Way of the Lower Eastern Shore Opioid Coalition to educate the public about addiction and available resources. Of course there will also be plenty of fun activities for kids such as therapy dog demonstrations, a free photo booth, a bounce house rock climbing wall and much more! The event will run from 7:30 AM to 12:30 PM. For more information, you can log on to www.peninsula.org/healthfest.